Firefighters had to spray millions of angry bees with foam and water, after a semi-truck overturned on an interstate on the outskirts of Seattle early on Friday. “Everybody’s been stung,” Sergeant Ben Lewis of the Washington State Patrol told local TV stations at the scene. 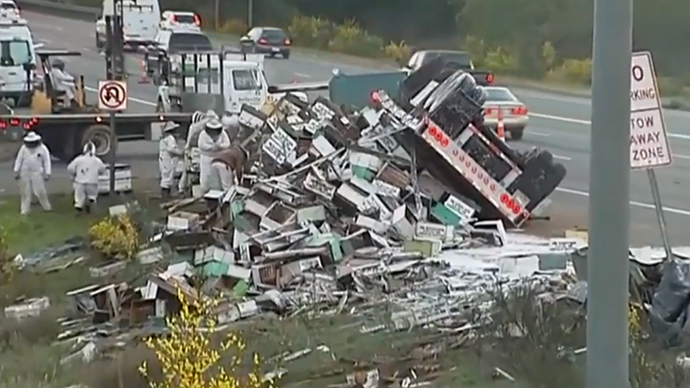 The driver told the police he blew a front tire as he tried to merge from I-405 to I-5, causing the truck to tip, spilling most of the 458 beehives on-board, over a trail of about 100 yards. Many of the bees died on the spot, while others were quiescent in the dawn light, before becoming aggressive as the sun came up. While police shut off two lanes, beekeepers, called up for an unusual emergency, kept smoking the hives with pungent substance that kept the bees disoriented and swarming on the spot, instead of attacking the passing traffic. Coincidentally, the Seattle crash happened just one day after a similarly rare accident in southern France, in which one million bees were killed. La Depeche newspaper reported that after a van with 72 beehive frames struck a car, the bees became stuck in their own nectar, and "glued into a kind of puree."